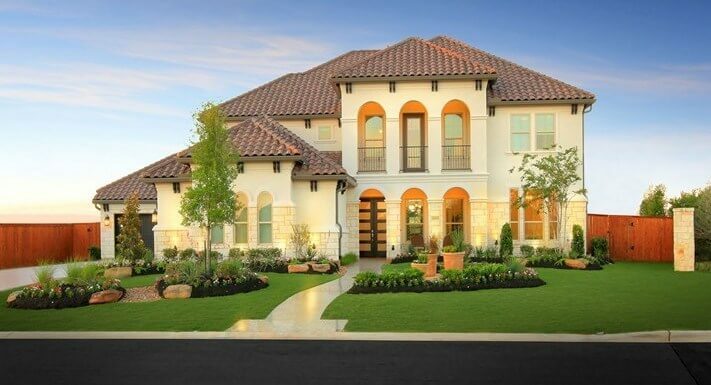 With a little TLC, you can keep your new landscaping looking healthy and green like in this exterior from Drees Custom Homes (Elmsdale model in Austin, Texas). Some buyers of new construction homes probably look forward to having a blank landscaping canvas to play with. A typical landscaping package could consist of a sodded front lawn and partially sodded back yard, a young tree and a few decorative shrubs or bushes. But, if you don’t have a particularly green thumb, trying to keep your new lawn, trees and shrubs alive can be intimidating. So, how do you get your beautiful new landscape off to a healthy start? When it comes to caring for your newly laid sod, it’s no surprise that proper watering is key. Mike Sisti of Weed Man USA in Montgomery County, Pa., recommended that for most full-season grasses provided by builders, you should water the sod four to five times a week for about 45 minutes to an hour to get the sod established. “If your sod is still wet or squishy the day after watering, you can wait another day to water again,” he said. After about a month of diligent watering, you can test the sod by tugging on it. It should remain firm and not pull up like a carpet. It’s important to get your sod well established, he added, because a healthy root system is the best defense against weeds. If you have thin spots, it’s easy for weeds to poke through. “You can pull them up, but they’ll keep coming back,” Sisti said. He recommended using an herbicide to kill any active weeds above the soil. Feeding your lawn is also important. Most sod comes with a month’s worth of fertilizer in it, so after that time, you should monitor how your sod is looking, Sisti said. If it has become established (the tug test), your lawn should be due for fertilizer at that point. He recommended getting one with plenty of nitrogen and potassium to help with growth and color and to strengthen the grass plant cell walls. Outside of the extremes of winter and summer, you can monitor the soil around the tree to determine how often to water. “You want the soil to dry out periodically,” Poth said. He recommended testing the soil’s wetness by pushing a screwdriver into the soil at the tree’s base. If it pushes in easily, you don’t need to water. For mulch, Poth recommended no more than 2-3 inches to help your tree retain moisture and serve as a protective barrier against lawn mowers and edgers. Your young tree probably came with two support stakes and wires to help keep it upright. Poth advised removing the stakes after a year, otherwise you risk the wires growing into the tree. The same time frame goes for pruning. “Give it a year in the ground,” Poth said, “then you can start by cutting branches that are crossing or are deformed. You should always start at the bottom and work up.” A pair of hand pruners are all you need to get started. Judy Marchman is an Austin, Texas-based freelance writer and editor who writes about home building and design, including for NewHomeSource.com. As the owner of a new construction home, she’s never without plenty of story inspiration.